I have been raising Tri color Rex for a few years and have come to understand a great deal about how it works. By using an understanding of basic color genetics, I have learned what colors work well with Tri color. By starting with my book knowledge and actually trying it out on my own breeding stock I have put together my own ideas on how to raise these eye-catching animals. It is best to start with a foundation that shows us what our Tri colors are capable of passing on. This color is one of the most recessive colors. This presents us with a question of what to breed to a Tri color? Bear with me as I illustrate what genes are involved. I have grouped the most important color genes and italicized the genes found in Red and Black Tri colors. There are also Chocolate and Orange Tri colors and Blue and Fawn Tri colors, but we will cover that later. Now we have an idea of where the Tri color sits on a ladder of dominance. This is important since colors that dominate and work against our goal will not give us desirable results. All Tri colors have one of the two pairings of genes: ej ej or ej e. The Red gene is the only one recessive to it and therefore is sometimes present without being expressed. Any time you have a gene that is dominant to another you have the possibility that it is hiding a more recessive gene. Always remember that your rabbit has inherited two genes for every aspect of its type, color, fur structure etc It had two parents giving it genetic information. That is why it tends to land somewhere between the two. Now that we have the technical aspects down, let's look at what we get out in the barn. First thing you want to keep in mind is that a Tri color is a Broken version of a Harlequin. This means that in order to get a Tri color you must start out with at least one Broken in your breeding pair. A Broken gene is always expressed if it is present. Next you will want to start with at least one rabbit that definitely has a Tri color gene and another that either has a Red or Tri color gene. Colors that definitely have a Tri gene are Tri colors and Harlequins, the rest are a guessing game. Reds and Fawns are the only colors that definitely don't have a Tri gene hidden. These are the rules if you want first generation Tri colors. Now, here are a few ways to side step the system if you are missing one of the above in the breeding pair. Second generation Tri colors can be a good idea if you want to improve type or if you lack the breeding stock necessary. The easiest way is to breed a Tri color to any color except Chinchilla varieties. Chinchilla, Sable, Seal, & Californian are all in that series and have been selected to reduce yellow (red) pigment. This is the last thing you want. Now these babies will mostly be castor or some type of agouti. Remember, a Tri color is inherently an Agouti before the Tri gene messes with it. Look at these Agouti offspring in good, strong light when they are just old enough to have a good covering of hair. You will notice a strange dappling effect, meaning faint spots will show themselves over the entire body. This is easiest to see in light areas such as on the belly, inside the ears, under the chin, around the eyes and down the sides. You should only be able to see the Tri gene peek through like this on an agouti pattern. Other patterns hide it too well. As the baby gets older it may become less obvious, but some have such a strong spot pattern that it never fades. Keep these and breed them to a Tri color if possible or to a Red, Broken Red or another baby out of the same type of cross. Keep in mind that the Tri color spots only appear as spots on a Broken. 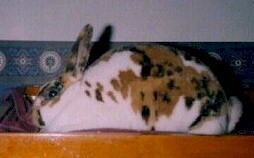 The solid bunnies in your litter will appear to have a brindle striping showing through. These are your Harlequins and also carry the gene you want. Unfortunately we are not always blessed with two beautiful Tri colors with good body and fur. Therefore, when you start crossing with other colors, or even with Reds, you will find the Tri color tends to lack the pattern you desire. Your semi-ugly babies have probably inherited most of those wonderful modifiers from the Tri parent and the other parent was not able to offer much. Therefore, those babies have roughly half the modifiers they need to "wow" you. You simply need to keep the best ones and breed them to nicely colored Tri colors in the future. It is possible to accidentally find a rabbit of another color that is capable of handing out enough modifiers, but this is a roll of the dice. (Yes, I have seen it!) Modifiers are only hard to predict because many of the ones we are looking for are hidden under colors that don't express them. Now here is one thought in reference to the different varieties of Tri colors. If you take a Black and Orange Tri color and dilute the amount of pigment, you get a Blue and Fawn Tri. This can be done by breeding to Blue and Fawn Tri colors or to use Blues, Opals, or Fawns for second generation crosses. Remember, the dilution gene is recessive and may not show itself in any first generation cross. Chocolate and Orange Tri colors can be created much the same way only this time you cross with a Chocolate and Orange Tri color or a Chocolate, Lynx or Lilac. All these have a chocolate base color. Be aware that the Lynx and Lilac will also pass on dilution genes. Chocolate is also recessive and may take a second generation to get results. Keep in mind that a recessive can't hide other genes in its group. Two Blue and Fawn or Chocolate and Orange Tri colors can not produce a Black and Red Tri color. The genes just aren't there. I hope my explanation has not been too complicated. It's hard not to confuse when Tri colors are involved. Hopefully this will give you some direction when faced with how to deal with this color. I have found this color to be a challenge, but very much worth my attention.